Materials handling equipment distributor MLA Holdings has formed a partnership with Sany to distribute its extensive range of container handlers and heavy forklifts in Australia. From now on, customers will be able to purchase Sany’s reach stackers, laden container handlers, empty container handlers and forklifts between 16 to 46 tonnes capacity from MLA Holdings. MLA general manager for sales and operations Matt Saunders says the company is thrilled with the new partnership. "MLA’s comprehensive stock of parts for the Sany range includes major components as well as any parts that may be required on a day to day situation," he says. "Sany’s modern day logistics software and technology also assures availability, quick delivery and reliable service by our factory trained technicians across Australia." MLA national Sany product manager Michael Kidd says performance, safety, economy, reliability and comfort are of primary importance to users of container handlers and heavy forklifts; all of which the new Sany range can offer. "Already we have supplied many Sany container handlers to the Australian branches of some of the world’s most respected companies," he says. "Sany in partnership with MLA has the vision and capability to offer a refreshing alternative to the Australian market." Based in China, the Sany group was founded in 1989 and is currently one of the largest heavy machinery companies in the world. Its products include excavators, concrete machinery, road construction machinery, materials handling equipment and more. Its European operation in Germany, Sany Europe manufactures the company’s mobile container handling equipment to meet the highest European standards using the latest technology and facilities. 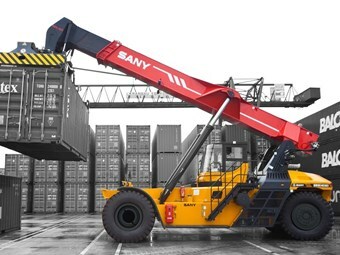 This means Australian customers have access to the latest and most innovative container handlers and heavy forklifts by Sany via MLA Holdings, backed up by the company’s heavy trucks service team and their extensive experience. Find container handlers for sale. Look up container handler specifications.